Holy stoopit idea, Franzman! 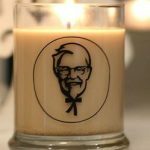 KFC has developed a new scented candle that smells like gravy. Engineers who worked on the candles paid attention to detail and designed the candles to have the same ratios of smells found in the ingredients of KFC’s actual gravy. With an engineering degree, it is my belief that you should be working on more important things. Comfort food, comfort smells. I think I made my opinion clear. What’s yours?